Clean Agent System: FE-25 and FM-200 Systems | Morristown Automatic Sprinkler Co.
Morristown Sprinkler installs both FM-200 and FE-25 to keep your valuable property safe. Morristown Sprinkler primarily designs, installs, and maintains two types of clean agent suppression systems: FE-25 (ECARO 25) and FM-200. 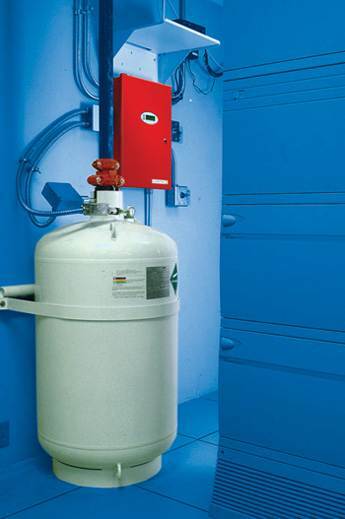 Although either fire suppression system will help businesses keep their important assets and equipment safe, there are some differences between the two clean agent systems. FE-25 comes closest to replacing the outdated Halon 1301 systems. This clean agent works by absorbing the heat energy and is environmentally friendly. FE-25 has better flow characteristics and uses 20% less agent than FM-200. Overall, the ECARO 25 system is the more economical and the more efficient of the two agents. FM-200 is the most common agent used, works by removing the heat to chemically suppress the fire, and is also environmentally friendly. Regardless of the agent used, both clean agent systems are safe for people and property. They leave no residue, and no expensive clean-up is required. They detect a fire promptly, and then discharge within 10 seconds to ensure business will not come to a halt if an unforeseen fire breaks out. Our technicians are experienced and factory trained for FM-200 and FE-25 suppression systems installation, service, and inspections. We are licensed by the State of Tennessee Department of Commerce and Insurance Division of Fire Prevention, and NICET certified. Morristown Sprinkler is a factory authorized distributor for Fike Protection Systems, Blue Springs, MO. To learn more about our clean agent systems, or to schedule an appointment with one of our specialists, please contact us today.